Other third-party controls (other Telerik RadControls for ASP.NET as well). Templates will not work when RadComboBox items are added via a WebService. In design time, add item templates to your RadComboBox control using the Template Design Surface. RadComboBox supports global template which affects the appearance of all items in the control. An <ItemTemplate> section is added to the RadComboBox declaration. The image in the template and the text that appears in the template is taken from the RadComboBoxItem using <%# DataBinder.Eval %> statements. 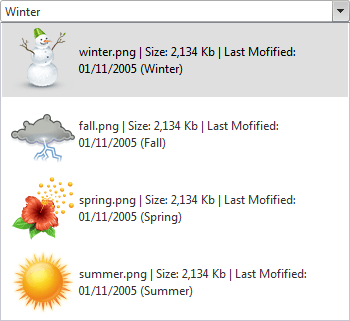 <telerik:RadComboBox RenderMode="Lightweight" ID="RadComboBox1" MarkFirstMatch="True" runat="server" Height="297px"
<telerik:RadComboBoxItem ImagePath="winter.png" DisplayName="winter.png | Size: 2,134 Kb | Last Mofified: 01/11/2005"
<telerik:RadComboBoxItem ImagePath="fall.png" DisplayName="fall.png | Size: 2,134 Kb | Last Mofified: 01/11/2005"
<telerik:RadComboBoxItem ImagePath="spring.png" DisplayName="spring.png | Size: 2,134 Kb | Last Mofified: 01/11/2005"
<telerik:RadComboBoxItem ImagePath="summer.png" DisplayName="summer.png | Size: 2,134 Kb | Last Mofified: 01/11/2005"
Before the template can use the RadComboBox item's properties to bind the elements in the template, the application needs to explicitly bind the items by calling DataBind method of RadComboBoxItem objects.